Microchip announces five new 1.8V temperature sensors, including the industry’s smallest five-channel temperature sensor with standard lead spacing. The EMC181x temperature sensor family also introduces system temperature rate-of-change reporting, a feature that provides advanced warning on how the temperature of a system is fluctuating. 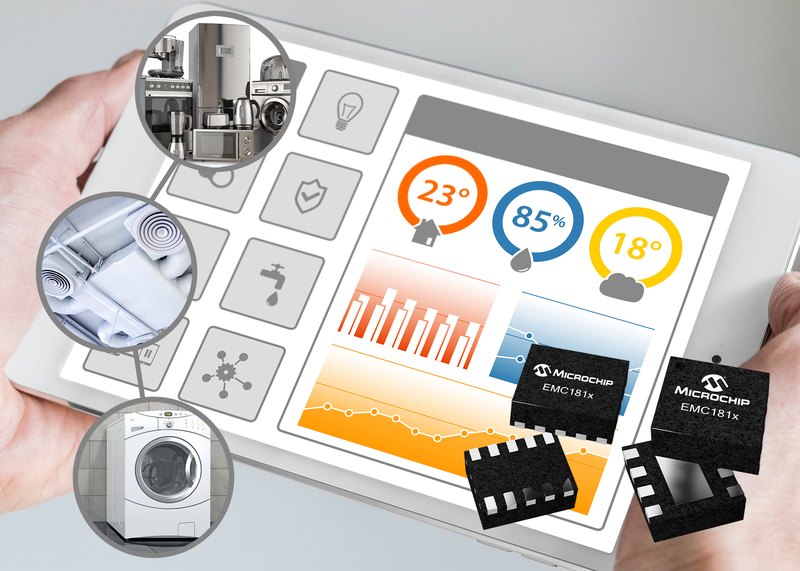 The temperature sensors enable designers to reduce power consumption and lower system voltage in applications such as the Internet of Things (IoT) and personal computing devices in which temperature measurement is central to functionality. Monitoring temperature at multiple locations with a single, integrated temperature sensor reduces board complexity and simplifies design. The EMC181x temperature sensor family offers a variety of remote channels at 1.8V operation to fit different design needs, ranging from two to five channels. The family is ideal for applications migrating from 3.3V systems to lower voltage rails, such as battery-operated IoT applications, personal computing devices, Field-Programmable Gate Arrays (FPGAs) and Graphics Processing Units (GPUs). Additionally, the EMC181x family is register- and voltage-compatible with Microchip’s popular 3.3V EMC14xx temperature sensors, making migration to 1.8V testable and achievable. With the three-channel sensor available in an 8-pin 2 x 2 mm footprint and the five-channel in a 10-pin 2 x 2.5 mm footprint, the sensors can also reduce the number of devices needed for remote temperature monitoring. With the ability to measure the system temperature rate-of-change, the EMC181x devices are the industry’s first to offer two-dimensional temperature sensing. In addition to reporting on the regular temperature, the feature notifies customers of the rate of temperature change in a system and shares data that can help to better regulate applications. Ideal for closed control loop systems and other applications that prioritise lower voltage rails, the system provides an early notification of rising or falling temperatures, protecting against potential system failure. At 1.8V, the EMC181x multi-channel sensor family is compatible with Microchip’s extensive portfolio of low-voltage and low-power microcontrollers. The ADM00773 evaluation board provides everything needed to demonstrate the 1.8V three-channel two-wire EMC1833 temperature sensor and gives functional insight into the other EMC181xx family members. It facilitates evaluation of programmable features such as rate-of-change, temperature alert limits and Resistance Error Correction (REC), in addition to providing off-board temperature measurements and data logging. The evaluation board connects to a PC through a USB interface board and comes with the Microchip Thermal Management Software Graphical User Interface (GUI). The EMC181x family consists of five devices, all available today for sampling and volume production. To learn more about the EMC181x temperature sensor family, visit www.microchip.com.